The UltraBright-LED is a new generation of blue light transilluminator. The UltraBright-LED has two side-mounted high intensity LED arrays. This produces uniform and bright excitation at 470nm making it suitable for a wide range of dyes. The UltraBright-LED is compatible with the following dyes: GelGreen, GelRed, SYBR Green, SYBR Gold, SYBR Safe, UltraSafe Blue and even ethidium bromide stained DNA gels. Gels up to 20 x 16cm can be viewed. The use of special filter material built into the lid of the UltraBright transilluminator greatly enhances the contrast of bands providing the optimum viewing conditions that are ideal for image capture and band cutting. UltraBright-LED is powered using a universal voltage, 24V power supply. The overall dimensions are 33.0W x 28.0Dx 9.0H cm. 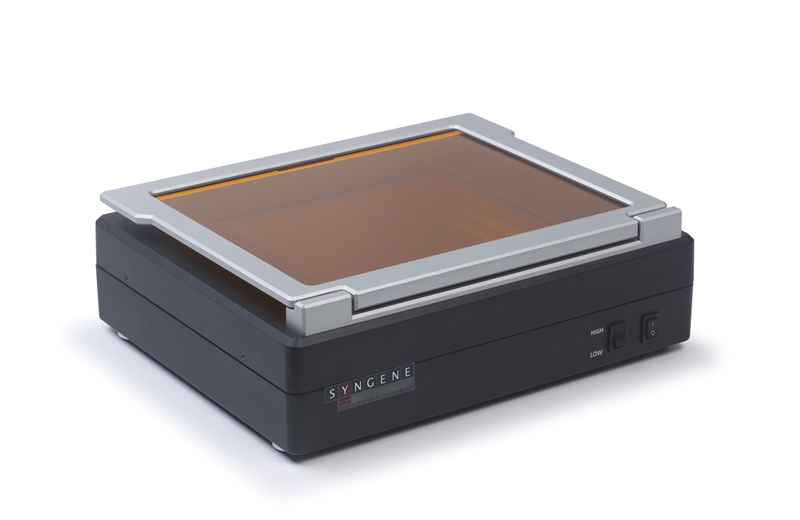 The UltraBright-LED can be used in a Syngene G:BOX or as a stand-alone unit. Blue light transilluminators are often used as an alternative to UV transilluminators when users wish to use 'safe dyes' instead of Ethidium Bromide. A blue light transilluminator is a 'safe' light source, in that the user is not exposed to harmful UV radiation and samples are free from photonicking. Syngene offers 2 models of blue LED transilluminator - UltraSlim-LED which has a maximum gel size of 10 x 12cm for use in the In:Genius3 and U:Genius3 systems or the UltraBright-LED which can be used with gels up to 20 x 16cm for use in the G:BOX series. Both models use side mounted 470nm LED arrays for illumination. High Sensitivity Using 224 high intensity LEDs, the UltraBright-LED illuminates a wide range of samples, producing fluorescence in even the faintest of bands. The illumination is high intensity and uniform, giving high quality images for publication or analysis. Small footprint The UltraBright-LED can be used as a stand-alone transilluminator and takes up very little laboratory bench space. Its overall dimensions are only 33cm x 28cm and it is easily portable to any location. The UltraBright-LED is compatible with any Syngene G:BOX system. Uses a wide range of dyes The UltraBright-LED transilluminator can be used with Ethidium bromide, GelGreen, GelRed, SYBR Gold, SYBR Green, SYBRSafe, SYPRO Orange, SYPRO Ruby UltraSafe Blue. (All trademarks acknowledged).